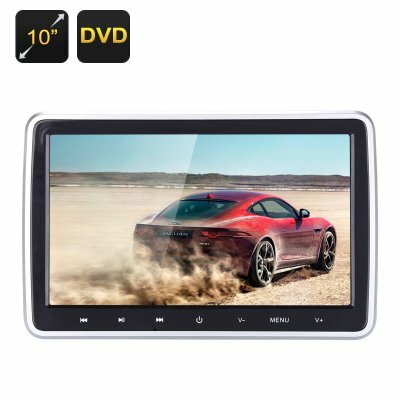 Successfully Added 10 Inch Car Headrest DVD Player - Region Free, IR Remote Control, Games Emulation, SD Card Slot, HDMI, Universal Fit to your Shopping Cart. A tried and tested way of ending the fighting and bickering of children’s disputes on long journeys, this fantastic car DVD player will keep you kids engaged and bring them hours of fun while letting you focus on the job of driving safely. Entertain and delight passengers young and old with this touch button head rest DVD player. It also comes with an IR remote control you can skip between functions and watch movies, listen to music or even play 32bit emulation games from any seat in the rear. With USB, SD card, HDMI in ports, as well as the support for all major DVD formats (DVD, VCD, MP4, RMVB, CD-R, CD-RW, SVCD and DIVX), there is no shortage of ways to content on this screen. This DVD player benefits from region free decoding so it isn’t restricted to any geographical area, making it great for use or resale around the world as it can accommodate all DVD regions. The 600cd/m2 screen brightness means you can view it clearly even in bright sunlight and the widescreen format is ideally suited to movies as there is no need for cropped images. With a 10 screen this rear seat entertainment package brings great visual and audio entertainment to almost any motor vehicle. The spring load bracket and fittings adjust to accommodate almost any headrest and let you install the DVD player in a matter of minutes. This 10 inch touch button headrest DVD player comes with 12 months warranty. Brought to you by the leader in electronic devices as well as wholesale headrest DVD players, Chinavasion..
Fast shipping and really good product for the money. No really bad points, maybe a better user manual. Also I have no idea how to play 32b games. I think there was supposed to be a game disc included, but I didn't receive it. Not sure someone can advise!